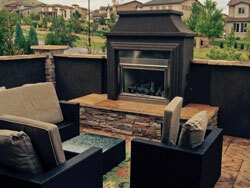 Backyards Plus designs and installs both custom and manufactured outdoor fireplaces. Our custom outdoor fireplaces use Majestic Fireplace's stainless steel outdoor fireplace inserts featuring a stainless steel mesh screen, a basket grate, concrete brick and a firebox lining. These gas inserts produce up to 60,000 btu's and are Underwriters Laboratory listed. A wide variety of shapes, sizes and finishes are available.